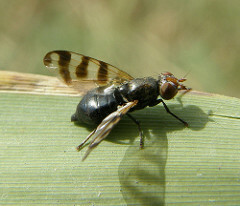 A relatively small family (20 British species) containing some very distinctive picture-winged flies, many of which can be identified in the field with the naked eye or a hand lens. Many of those picture-winged species actively wing-wave as they walk over foliage (e.g. Herina and Seioptera) or tree trunks (Myennis).